In 2010, Bryce Harper took home The USA Baseball Golden Spikes Award at The Rod Dedeaux Foundation Annual Awards Dinner. 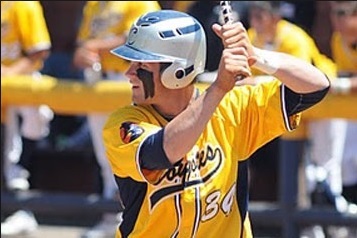 Bryce batted .443 with 31 home runs that year at Southern Nevada. In 2010, Bryce Harper also took home The 2015 National League Rookie of the Year Award. Congrats Bryce! Also, our 2013 Golden Spikes Award, Kris Bryant, took home the 2015 National League Rookie of The Year Award. The USA Baseball Golden Spikes Awards continues to unquestionably be the best indicator of future success in baseball. There has been 38 winners since Bob Horner won the first award in 1978. 34 of those 38 players made the majors, 17 have been All-Stars, 5 have won Rookie of The Year, 3 have pitched no hitters, and 2 are current major league managers. The Rod Dedeaux Foundation was founded by the legendary baseball coach, Rod Dedeaux. Rod was the head baseball coach at the University of Southern California for 45 seasons, and retired at age 72 in 1986. His teams won 11 national titles, including a record five straight (1970-1975) and 28 conference championships. Dedeaux was named Coach of the Year six times by the Collegiate Baseball Coaches Association and was inducted into its Hall of Fame in 1970. He was named "Coach of the Century" by Collegiate Baseball magazine, and was one of the ten initial inductees to the College Baseball Hall of Fame. He also coached the Team USA baseball team in the Olympics in 1964 and 1984. He is widely regarded by his peers as among the best amature coaches of all time. The Rod Dedeaux Foundaton is now run by his family to continue the legacy and dreams of Rod Dedeaux. We are a 501c that exists to support at-risk youth in urban communities through baseball, softball, and other programs. Currently, inner city organizations are fighting for survival as public funding is drying up, and our youth need healthy and supportive options. Through the efforts of the Foundation, youth get to play on well organized teams, receive training, uniforms, and renovated facilities; they receive a sanctuary from challenging environments and a support system specifically designed to build character and academic support to enable underprivileged youth to achieve their dreams. We are very proud to successfully support these important and life changing youth programs. We invite you to browse our website to see how we are working hard to continue to support our youth and their communties. If you would like to support us with a donation then click here, if you are a corporation and would like to purchase a sponsorship table at our awards dinner then click here.